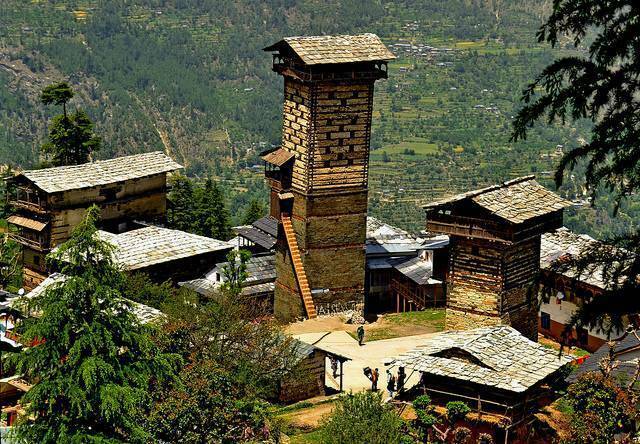 Chehni kothi is situated in Banjar Valley, Himanchal Pradesh, this grand architectural wonder lies a few kilometers above Banjar in Kullu Valley. Chehni Kothi came into existence 1500 years ago when it was constructed for the Himalayan King named Raja Dadhiya and still has its magnificence maintained. The kothi is an elegant piece combing traditional art and advance building technology of that period. The earthquake of 1905 damaged much of its height and what is left not is the restored structure which is still a 10 story tall structure. But despite of the wear and tear the kothi speaks for itself, the grandeur attached to it and the architectural skills of the artisans of that times.One way to climb up this tall scraper is through thickly cut wooden logs arranged as stair case. Tourists are advised to read the signboards carefully while inside the Kothi. Residence of Rana Dhadhia, this mansion had 15 stories but presently only 10 are left. Chehni Kothi is in Banjar valley and is 53 KMs from Kullu.